Care Packages for Soldiers: Soldiers Receive Luau Themed Care Packages!! Soldiers Receive Luau Themed Care Packages!! 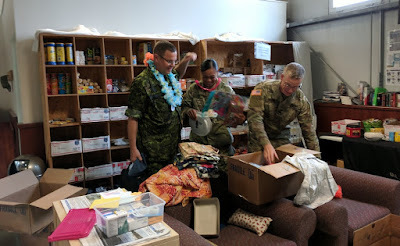 Here is a note and some pictures from a soldier that received the care packages we sent out at the beginning of the month. Besides the usual toiletries, snacks and food items, these packages included luau items to add a little fun. I am responding to an email from my military email to inform the airborne angel cadets that we received your awesome packages. They are always filled with great items. Whenever we see boxes from your organization it brings excitement and know we are going bring many smiles to service members. Your care packages have helped in bringing small comforts from home and allowed all of us to share in fellowship. Attached are some photos from boxes we recently received about a week ago. Attached are some photos. Aloha! 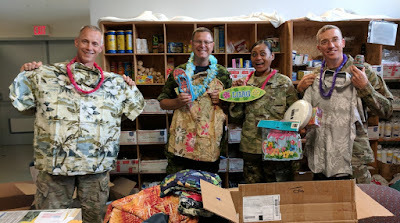 The boxes contained luau shirts, leis, party plates and napkins to add a little fun to their day. 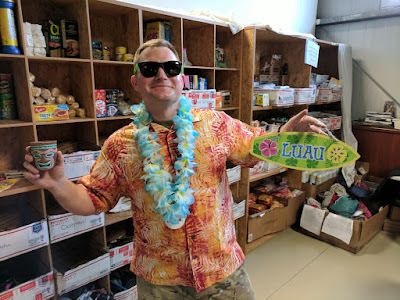 Here are some of the luau items that were included in the care packages. All decked out and ready to party!